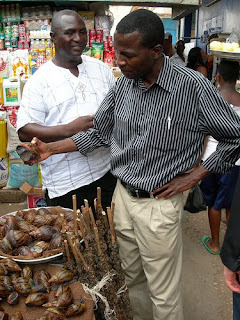 These were the largest snails I have ever seen in my life. We found these on the last day in Makola Market in central Accra. The market was exactly as you might imagine a market, loud, booming and full of exotic smells, sights, and sounds. The man in the picture is Dr. Siro Masinde, a botanist and Aluka’a African Coordinator. He was immensely curious as to the species of snail and did some research. See below for his comments. If you want to see all the pictures from the Accra set in Flickr, please click here.